By Leah Dobrinska. Apr 12, 2017. 9:00 AM. Historian and writer Esther Forbes had a knack for bringing the life and experiences of the past to present-day readers through the pages of her books. Most well known for her books, Paul Revere and the World He Lived In (1942) and Johnny Tremain (1943), Forbes’ writing garnered her attention from the outset. Her first published novel, O Genteel Lady! was selected as the second book for the Book of the Month Club, ensuring her book was sold to a wide readership. In a review in The Independent, O Genteel Lady! was described as “A distinguished first novel, written with ease and a mastery of technique unusual in a young writer." Indeed, Forbes was a master of her craft, and to this day remains one of the premier contributors to historical and historical fiction writing. Born in Westboro, Massachusettes on June 28, 1891, Esther Forbes was the fifth of six children in her family. They moved to Worcester when she was seven years old, and later in life, she would spend her days writing and researching with her mother’s help at the American Antiquarian Society in Worcester. In 1960, she was the first female elected to the Society, and she gifted the royalties of her works to the AAS following her death in 1967. As a child, Forbes was considered an abysmal student due to dyslexia and poor eyesight. She struggled in school; however, she thrived when given opportunities to write, in many cases skipping class when the urge struck her to put her pen to paper and tell a story. In one instance, when Esther’s class was given the freedom to write about anything they chose, she turned in an imaginative story, dripping with creativity, only to be accused of plagiarism by her teacher. This accusation instilled in her a fear of presenting her work to any other teacher down the road. In fact, it took years for her to find someone she was comfortable sharing her writing with again. It wasn’t until she had re-located to Madison, Wisconsin where two of her sisters where living that she found a teacher at the University of Wisconsin who encouraged her to submit her work for publication. With this support, Forbes had a short story titled “Breakneck Hill” published. The story earned the O Henry Prize in 1915. Indeed, that story was the first in a long line of Forbes’ writing to earn her literary accolades. Her biography of Paul Revere, Paul Revere and the World He Lived In was published in 1942. Forbes used letters written to and from Revere to gain a keen insight into his life and work and present it to her readers. The result is a masterful portrayal of a key figure in American history. The book won the Pulitzer Prize for History in 1943. In the same year, Forbes published her most well-known work, a young adult novel titled Johnny Tremain. In an almost fittingly full-circle way, Forbes had to fight to have her original text published. When she initially presented her draft, the publisher wanted to mark it up and make significant changes. Disenchanted with that idea, she took her work to Houghton Mifflin who agreed to publish it as Forbes intended it. The rest is history. The book has yet to be out of print. Johnny Tremain chronicles the coming of age of the title character as he navigates his role in Boston at the tipping point of the American Revolution. In it, readers are given a front-row seat to the Boston Tea Party and the Battles of Lexington and Concord. A story about family, friendship, sacrifice, and patriotism—all seen through the eyes of a young boy—Johnny Tremain earned Forbes the Newbery Medal for distinguished contribution to children’s literature in 1944. 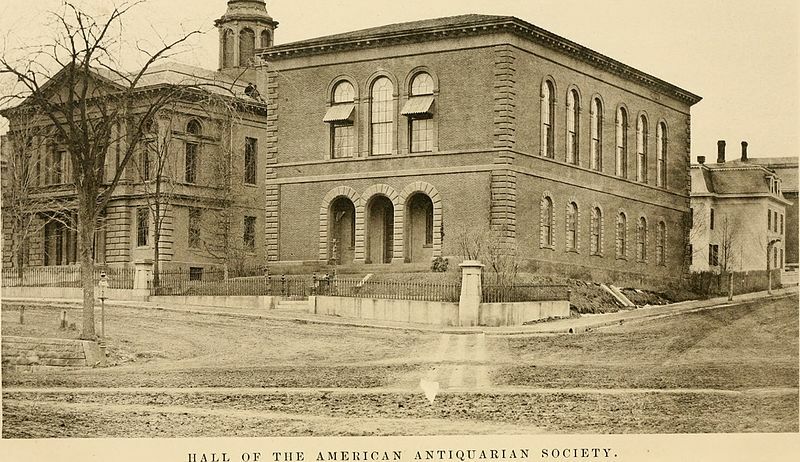 Forbes continued to write and research in her later years, spending much time in the American Antiquarian Society. She passed away on August 12, 1967, seven years following her election as the first female member of the Society. Fortunately for us, her works live on, and the past that she captured through her words can be enjoyed by present-day and future readers. Sources: City of Words, Jake Bales, Image source.